Shortly after my husband and I got married and combined our finances, we faced a reckoning in our budget. As we created our first combined spending plans and started our system of targeted savings accounts, we realized that our month-to-month spending was out of sync with our values and short-term goals. Chiefly, we wanted to put aside more money for travel spending, which meant that we had to find other areas in our budget to cut back. On the chopping block: eating out for convenience. While our restaurant spending was never astronomical, we had each fallen into a pattern of buying convenience food on a regular basis. Among other reasons, I tended to buy a quick dinner on campus when my lab experiments ran into the early evening, my husband bought a fast food dinner every week on his way from campus to an evening activity, and we also occasionally went out to dinner just because we didn’t feel like cooking. We determined that these convenience meals were not a great use of our money, especially in light of our travel goals. So we made a spending rule: We only ate out with other people on social occasions; we eliminated eating out alone or with each other. We held to that rule almost perfectly for our last few years of grad school, though I admit we started deviating a bit while dissertating! In this post, I’ll share our strategies for sticking with our no-convenience-eating-out rule. I know this topic is of high interest to grad students (with busy schedules!) who are looking to reduce their spending. Most recently, we discussed it at length in Grad Student Finances’s monthly live money chat. (If you want to join our next money chat, sign up for the mailing list here to receive more information.) Even if you don’t want to eliminate eating out for convenience entirely, implementing these strategies will help you to enjoy eating out more when you choose to because it’s not done out of desperation. The very first step to eliminate eating out for convenience is to take note of when and why it happens. In all three scenarios I listed for my own life, dinner was the issue. My husband and I never ate out for breakfast and rarely did for lunch, as we were consistent brown-baggers. Since dinner was the problem time for us, that was where we focused our energy for creating solutions. I realized that I tended to get hangry and need to eat right away; if there’s not ready food available, I would buy something because I couldn’t wait an hour or two to get home/shop/cook. So part of my solution was to keep homemade food available (more on that next). The pattern you identify in your convenience eating could relate to any meal or snack of the day or more than one of them. Maybe you’re not a morning person so you habitually stop for a coffee and bagel on your way to work. Maybe you like to take a nice break for lunch, and part of that is leaving your office to go to an eatery on campus. Maybe you need a pick-me-up snack in the mid-afternoon to keep from nodding off while reading. Maybe you tell yourself you deserve a night off from cooking after a long day in the lab. Work first to identify the situations in which you habitually buy convenience food or are tempted to, whether those are based around a meal, a time of day, a feeling, a stressor, a regularly scheduled meeting, etc. 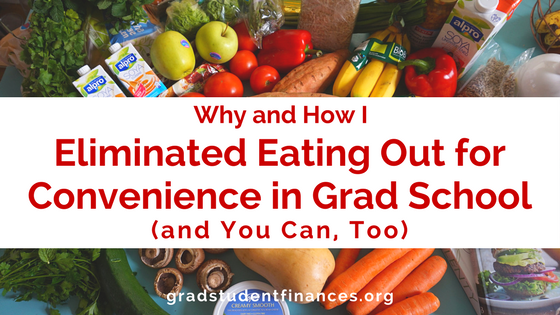 If you are buying convenience food on campus or on your way to on from campus, like my husband and I were, the easiest solution is to keep food on campus in your office, department lounge, or whatever personal space is available to you. We were consistently bringing our lunches with us every day and keeping them in our shared refrigerators. After identifying dinners as our weak point, we started bringing in dinners as well. On the days of the week that we knew in advance that we would need to eat on campus (like before a regular evening activity), we just brought in our lunch and dinner together. But I also started bringing an extra dinner in with me on Monday to stay in the fridge for the week to be eaten on whatever night I happened to stay late (and if that was early in the week, I’d bring in another the next day). In this way, I planned for the eventuality of needing to eat on campus, even though I didn’t know exactly when it would happen. You don’t necessarily need to bring in a full extra meal to make this work. If you just need to tide yourself over for an hour or two, a snack will do just fine. If you choose shelf-stable foods or long-lasting refrigerator foods, you don’t even need to change them out every week. No kidding, batch cooking changed my life. When I first started eating out of my own kitchen and learning to cook, I prepared one-serving meals, which was very time-consuming and didn’t allow me to use frugal strategies like buying in bulk. I also ate a lot of pre-prepared foods and meals out because that kind of cooking was so exhausting. Our slow cooker changed all that for me. While batch cooking is not limited to slow cookers, it is a good entry point. I started making 8+ servings at once of hearty chilis and soups in our slow cooker, which were easy to toss into a Tupperware and bring to campus for lunch or dinner. From there I moved on to other styles of cooking, but always making at least 4 servings at once. Batch cooking is perfect for a busy grad student as it is so time-efficient. Batch cooking was key to eliminating our convenience eating out because 1) it created those meals that we wanted to keep on campus and 2) we always had food ready for reheating at home. Gone were the days of convincing ourselves to eat out because we had no groceries at home or cooking would take too much effort. Batch cooking also leads easily into this tip: eat, then cook. When I arrive home from work hungry, the last thing I want to do is spend a bunch of time cooking! People are always saying “don’t grocery shop while hungry” because it leads to poor decisions, and I apply the same logic to trying to cook while hungry. I get impatient and am liable to go off-plan. So my (largely unconscious) strategy became to eat a pre-prepared meal upon arriving home, then do any necessary cooking for the following day(s). I did try to batch cook on the weekends, but usually I also needed to do it once or twice during the week, so I made sure that I had a dinner already available on those nights so that cooking could be put off until the later evening. Tying in closely with batch cooking and always having a meal available to you is freezer cooking. This is not a strategy I personally employed, but it works amazingly well for many people. Basically, you prep/cook one or more meals that are to be immediately frozen and then reheated/cooked at a later time. If you have a meal available in your freezer, you will never have an excuse to stop for convenience food on your way home. This strategy also works very well for people who want to batch cook but don’t want to eat the same thing every single day. You can cook a four-serving meal, for example, eating one and freezing three. Rotating through that a few times will give you a selection of different freezer meals so you can spontaneously choose which to eat for any given meal. I’m a big believer in creating habits to avoid decision fatigue. I do not want to have to think about what I’m going to eat 3-4 times per day, 7 days per week. Eating the same meals over and over again makes my life so much easier. Grocery shopping, cooking, and eating all become consistent and decisions are minimized. If I have my meals planned out and food available to me, such as through batch cooking, I don’t have the opportunity to decide to eat out for convenience. Luckily, my personality allows for eating the same dinner multiple nights in a row without becoming dissatisfied. If you crave more variety, meal planning can help you preserve that while still eliminating on-the-spot decisions. When you meal plan, you decide in advance what you’ll eat throughout the week. Often, weekends are used for shopping and prepping/cooking all of the meals, so all you have to do during the work week is carry out the plan with minimal effort. It’s a tough adjustment going from eating family meals growing up or dining hall meals in college to cooking for one or two as a young adult. There is absolutely a learning curve, and sometimes convenience eating is part of that. But as you gain skills in the kitchen and clarity on how you want to use your money, you can make the decision to eliminate eating out for convenience. Start with identifying when convenience eating crops up in your life, then apply these strategies to combat it. What strategies do you use to avoid eating out for convenience?